Guaranteed win at William Hill on Sunday 2nd October 2016! 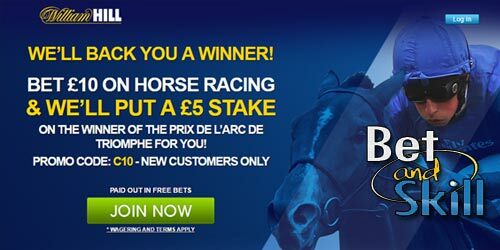 Place a £10 bet on any UK or Irish Horse Race between now and 15:05 on Sunday, and they willl automatically place a £5 free bet on the winner of the Arc de Triomphe for you, guaranteeing you a win up to £100. New Customers Only. T&Cs apply. You must stake a minimum of £10 on Horse Racing. Qualifying bets are those placed on any UK or Irish horse race running up to the time of the Prix de l'Arc de Triomphe. To qualify, first £10 bet upon opening the account must be on horse racing. Due to the abuse of free bet promotions, customers using Skrill, Skrill 1-Tap, Neteller or PaySafe to deposit will not qualify for any free bet sign-up offer. Applies to new accounts opened in the UK and Ireland only using GBP and EUR currency. This offer is only available to new William Hill customers who open an account using the valid promo code C10. Duplicate accounts will not qualify for this offer. Only 'one new account offer' per person, household address, email address, debit/credit card number, or IP address is allowed. William Hill reserve the right to withhold or reclaim any free bet stakes allocated to customers not in the UK by mistake. William Hill reserve the right to withhold any free bets if we believe that the promotion has been abused or where irregular betting patterns have been discovered. Free bets must be placed within 30 days of award otherwise they will expire. Free bets will be credited within 24 hours of the race finishing. Free bets can be spent on any bet type except to fund tote, pool or lottery bets. This offer is valid until 2nd October 2016 at 15:35 UK time. Your free bet must be used as one single transaction and cannot be partially redeemed. Redeemed free bets will not qualify for any future free bets. Qualifying bets must be placed from the customer funded balance. Redeemed free bets will not count toward qualification to view streamed events. "Guaranteed win at William Hill up to £100 (Arc De Triomphe betting offer)"